Crown Meat & Provisions Inc. offers a superior selection of bacon. Bacon meat is a necessity in many kitchens, especially those serving breakfast, and we offer a quality product year-round to satisfy your needs and the cravings of your customers. Bacon, like pork and ham, comes from the pig, but goes through a curing process in larger quantities of salt. The meat is then dried or packaged in a salt solution to provide that great taste we all know so well after cooking. 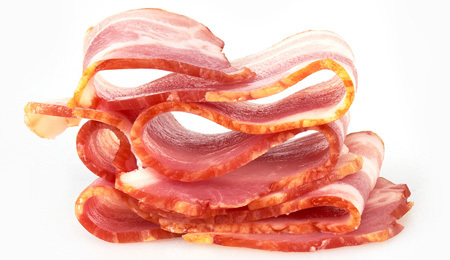 Bacon in our country is traditionally taken from belly meat. Because of its preparation and location on the animal, bacon is a taste that customers have grown accustomed to. Expectations to appease that great taste are high, and we’re prepared to help you meet them. Our research department has taken the time to determine the bacon brands that truly raise, process, and prepare their meat the right way, providing you with superior taste and your customers with the experience they expect. Our facility is USDA-inspected. We pay close attention to cleanliness, proper processing, and distribution. We also strive to be of the utmost convenience for our restaurant owners and chefs, offering delivery direct to your kitchen or will call as needed. If you’re interested in ordering bacon for your kitchen, we will be happy to walk you through the cuts, brands, and quantity you require to satisfy your patrons. Crown Meat offers the same brands year-round, so a solution today is sure to serve you in the future. Contact our knowledgeable staff today to get your order started.